We’ve been blessed with many good cooks in our family which means family gatherings of any sort are not events you leave feeling hungry. Let’s take the most recent example for instance; we visited my grandparents’ house to can salsa and for lunch had homemade vegetable soup, crackers, our pick between five lunch meats and various toppings to make sandwiches and homemade apple pie. That’s in addition to the doughnuts and muffins we had as a late breakfast and the macaroni salad my grandma forgot to get out with lunch! We may always joke about the amount of food around, but I promise you noone complains! 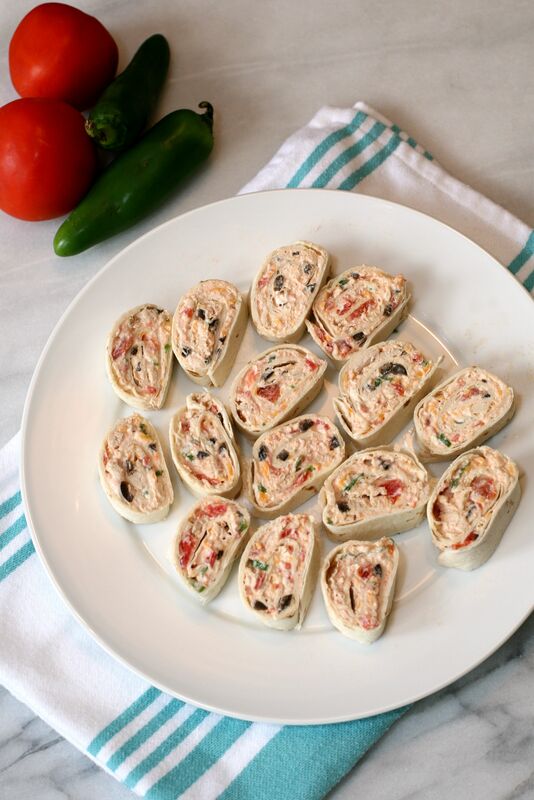 I first discovered these tortilla pinwheels at Thanksgiving. My Aunt Rose has these delicious appetizers at every holiday she hosts, lucky for us! Like a story I’ve told multiple times before, I have no idea why I waited so long to make these myself. The process couldn’t be simpler and the end result didn’t last long in our house! If you attend my next party or ‘get together’, it’ll be safe to assume these or another version of tortilla pinwheels will be on the menu! Let me explain just how easy it is to make these bite size snacks. The first step is combining the cream cheese, sour cream, diced tomatoes (Rotel), garlic and seasonings using a hand mixer. At this point I got a little worried I had already found a way to mess up something so easy, because my mixture was quite ‘liquidy’, to speak in technical terms. I thought maybe I didn’t drain enough juice from the tomatoes before adding them, but came to the hopeful conclusion it would thicken up after the next step of adding shredded chicken, cheese, green onions, olives and jalapenos (for those who enjoy the spicier things in life) and mixing with a spoon. Phew! I was right! I cooked the chicken in the crockpot that morning while Hailey and I did some shopping so when we got home it was ready to be shredded and used. You can also use rotisserie chicken (skin removed) or canned shredded chicken if you need to speed up the process. My other tip is to shred your own cheese! I do this 100% of the time and only buying block cheese. So.much.better! Once everything is mixed, start spreading the filling on tortilla wraps. 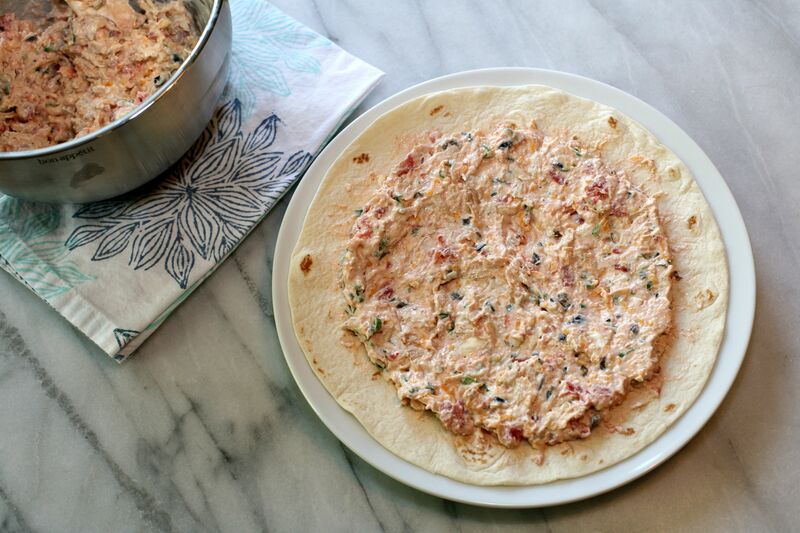 You’ll want to leave around a half inch border around the tortilla as you spread the filling. The first one I made had slightly too much filling making it a little more tricky to roll up and a bit bigger than I’d prefer when sitting out as an appetizer. I made three total so I simply adjusted the amount in the last two rolls. 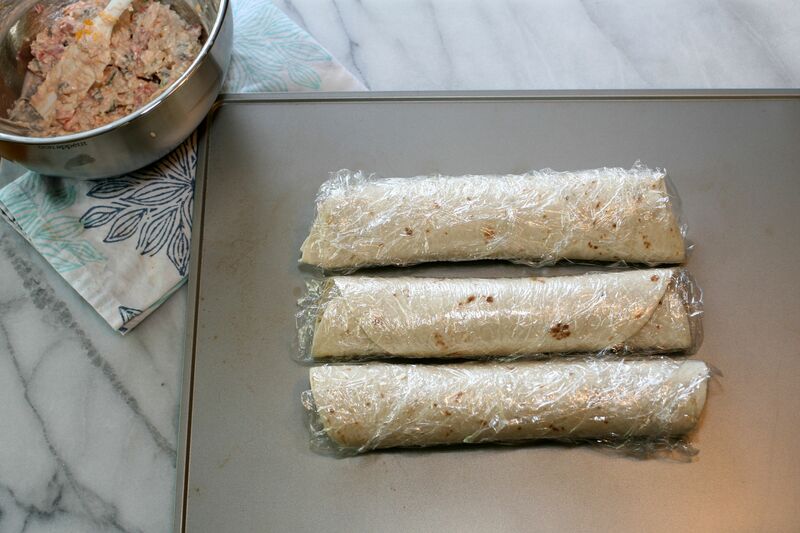 After the filling is spread, roll the tortilla tightly and wrap in saran wrap. After they are all rolled up and wrapped, place them in the refrigerator for an hour to chill. You could easily make the filling early in the day if you’re preparing these for a party or holiday gathering, but I would recommend doing this last part as late as possible since the tortilla wraps naturally get a little soggy after a period of time. To level set though, we finished eating these the next day and they were still delicious! I also kept some extra filling out and discovered it works equally as well as chip dip! Adding the filling to scoop tortilla chips would be a great alternative to the wraps! Other great uses are kids lunches and after school snacks! Check out the exact recipe below and enjoy! Using a hand mixer, combine cream cheese, sour cream, Rotel tomatoes, garlic and seasonings. 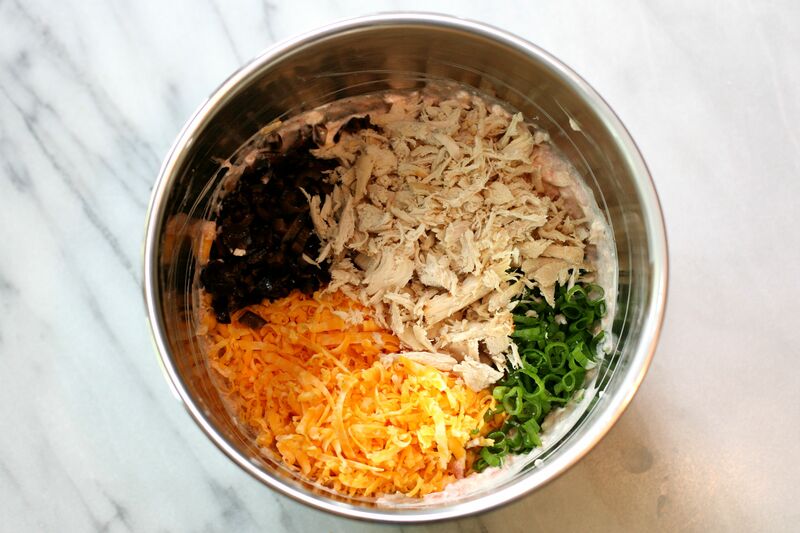 Add cheese, green onions, olives, jalapeno (if using) and shredded chicken and stir gently with a spoon to mix well. Spread the mixture over each tortilla leaving a 1/2 inch border around the edges. Roll up tightly and wrap each roll in saran wrap. Transfer to the refrigerator to chill for an hour or until ready to serve. Remove from the refrigerator, unwrap and slice into 2″ pieces. These were excellent and so easy to make! I thought I would have leftovers but my son took care of that! This recipe is also perfect to use as a dip with tortilla chips!